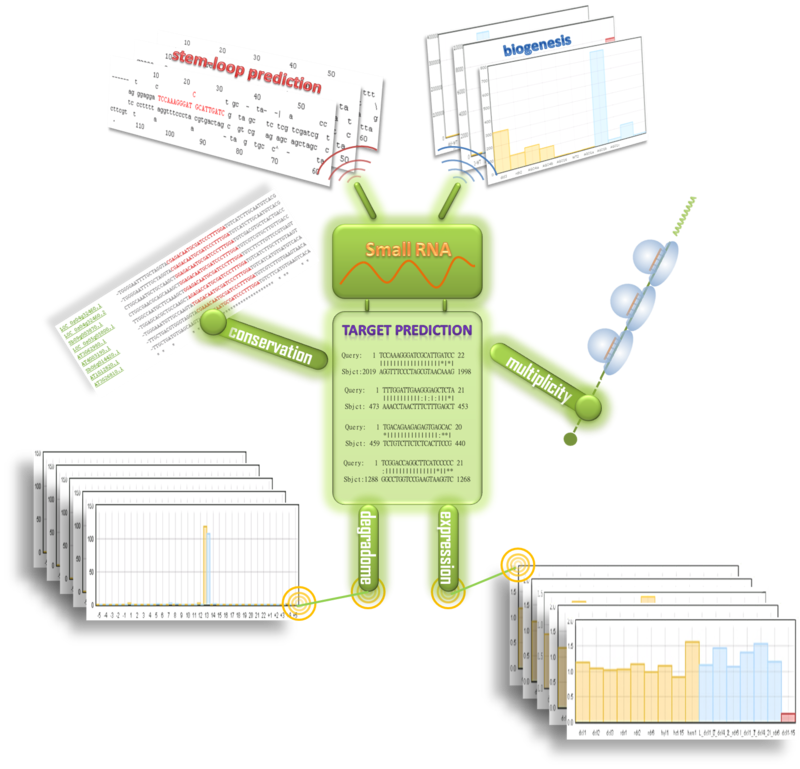 PsRobot is designed to analyze batch of plant small RNA data. The stem-loop small RNA prediction (try it out) module can identify stem-loop shaped smRNAs, including their expression in major plant smRNA biogenesis gene mutants and smRNA associated protein complexes to give clues to the smRNA generation and functional processes, their genome locations and precursor sequences. The second module, small RNA target prediction (try it out) module, can return target prediction results of smRNAs, including smRNA target list, target multiplicity, target site conservation and biological data support, such as degradome data and target expression data in small RNA biogenesis mutants. PsRobot also features a local version. The local programs offers a larger capacity for input data size and has the function to incorporate user-uploaded degradome data. Please go to the Software section for details. For more detailed information and user guide, please check our manual page. If you have any other questions, please don't hesitate to contact us. Added wild tobacco (Nicotiana benthamiana) genome and annotated transcript library to the online version of psRobot. Added barley (Hordeum vulgare) genome and transcript library to the online version of psRobot. Added tomato (Solanum lycopersicum) genome and transcript library to the online version of psRobot. Added mature miRNAs library of two Chromalveolata species (Ectocarpus siliculosus and Phaeodactylum tricornutum) according to miRBase R19. Added Ectocarpus siliculosus genome in the stem loop small RNA prediction module. Together selection of a miRNA library and a transcript library is allowed in the target prediction module. But please be cautious that this kind of predictions may take as long as hours or even days because of the large number of computational operations. The pre-loaded miRNA sequence libraries are updated to the currently newest miRBase Sequence Database Release 19 in the small RNA target prediction module. Malus x domestica (Apple) genome and mRNA are added to the library. Brassica rapa genome and cDNA data are added for the stem-loop small RNA prediction module and small RNA target prediction module repectively. Allowed special characters (e.g. "N") in the online submission of nucleotide sequences.